I think even meat-eaters would like this pulled-pork like barbecue goodness. 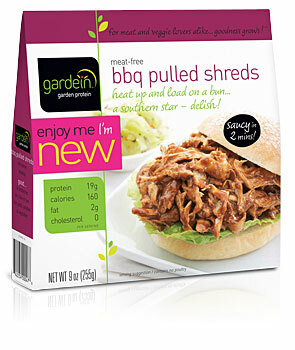 I was skeptical, even though I like this kind of thing, but Gardein’s meat-free BBQ Pulled Shreds were delicious! Even better that I get almost half the protein I need in a day in just one serving, and there’s only 2 grams of fat. I was skeptical of the taste of the barbecue sauce more than anything, but I even liked that a lot! Perhaps it was the “new bold bbq sauce” it touts on the front of the package. In addition to protein you get a bit of vitamins A and C, calcium, fiber and 45 percent of your daily iron — not bad!I t only costs about $4 and you can toss it in the microwave in the bag it comes in, so it’s fast, easy and way cheaper than even get a sandwich at Subway these days. Even better. Entry filed under: Product Reviews, Store Bought Food Items, Uncategorized. Tags: bbq pulled shreds, fake meat, Gardein, meat-free.